Have you tried somun at “Aisa“, visited “Biban“, in “Park Princeva“, do you know Trebevic and surrounding picnic areas as your palm, as kid you run several times from Brewery to Trebevic with a famous cable car? Bistrik is a settlement on the side of Miljaka which defies to Vratnik and represents the cold side. It got its name from Bistrica, Bistrica creek that is one of many tributaries of the river Miljacka which inflows to Miljacka near Latinska cuprija, and some time ago, there were several brides upon it. In the Ottoman times, part of this settlements had the official name Mahala dzamije – bega Isabegovica. Also nearby are: Jedileri tombs, Cokadzi hadzi-Sulejma mosque, Konak, Careva mosque, Rijaset, Monastery and the Church of St. Anthony of Padua, Sarajevo Brewery etc. Certainly, the special charm of this side is one of the attractions from the childhood of the most of Sarajevans, widely known Sarajevo Cable Car. With 50 gondolas, it could transport 800 visitors in 12 minutes in both directions. The environment is also graced with Konak at Bistrik, renovated and decorated blockhouses, revitalized objects of Bosnian architecture, aligned with the remains of the architecture of the Ottoman empire. We cannot omit the “lady at the top of the hill“, famous Railway station Bistrik, at which popular Ciro rested. From the plateau of the former railway station Bistrik, settlements Toka Dzeka, Mahmutovac and Hrid can be nicely seen. 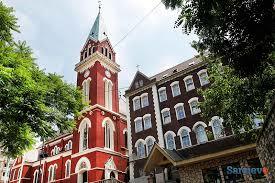 Franciscan Church of the St. Anthony of Padua and Konak, and two monuments at the temporary list: the building of the railway station Bistrik and Sarajevo Brewery.